Tenacious, and dangerous around the goals, Lindsay John ‘Jack’ Spencer roved for the Blues for three seasons in the nineteen-fifties. He was a mature 24 year-old with a wealth of football experience when he was recruited in 1952, having spent the previous five years in the rough and tumble of the VFA with Brunswick. Carlton first approached him after he finished runner-up in the VFA's Best and Fairest award (the Liston Trophy) in 1950, but he insisted on spending one more year at Brunswick. 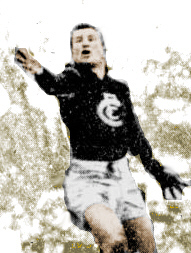 Spencer had had a somewhat meteoric rise with the Association Magpies, heading their goal-kicking table each season between 1949 (his debut year) and 1951. Remarkably consistent, he had notched up 48, 47 and 48 goals respectively, and represented the Association against the ACT in 1949 before finished runner-up in the Liston Trophy the following year. Jack made a promising start with the Blues, playing 15 games and kicking 27 goals in his first season, which culminated in a heart-breaking, 1-point defeat by Fitzroy in the first Semi Final. Still, he picked up five Brownlow Medal votes on the way, and established a good rapport with his roving partner Jack Mills. Sadly, there was to be no repeat finals action for Carlton in 1953, as the team slipped to fifth place on the ladder. Nevertheless, Spencer was consistent and reliable in his 18 matches, and his tally of 32 goals was good enough to win him the club’s top goal-kicker trophy. Jack’s career peaked with that award, because sometime in the early part of the following season, circumstances conspired to send his consistency off the rails. Under the same coach (Percy Bentley) and the same captain (Ken Hands) who had guided him the previous year, Spencer lost form in 1954. He played only eight of the first twelve games of the season, and sat on the reserve bench in three of them. Three more senior appearances came by August, but Jack just couldn’t seem to string good games together anymore. He kicked just eight goals in his last eleven matches, then retired after Carlton fell to Essendon by 4 points at Princes Park in round 16, 1954. Jack was joined in his retirement that afternoon by popular defender George Stafford, and champion ruckman Jack ‘Chooka’ Howell. After departing from Princes Park, Spencer coached Portland in the 1955 season. He passed away on the 3rd April, 1998, aged 70. Contributors to this page: blueycarlton , PatsFitztrick , pblue , Bombasheldon , tmd1 , molsey , p(12)terg , dgreen2 , true_blue24 , nikki , steve and admin . Page last modified on Monday 28 of August, 2017 09:05:51 AEST by blueycarlton. 1994 - Barry Mitchell shoots for goal.